Children need Vitamin D as much as adults. This is because this essential nutrient is essential to physical development, particularly in terms of promoting healthy bone growth. Sure enough, Vitamin D is mostly associated with improving calcium and phosphate absorption, which is crucial to developing a healthy body frame as the child undergoes drastic physical changes. That being said, it’s important for parents to make sure that their kids are substantially equipped with enough Vitamin D to aid them throughout an assortment of challenges as they reach puberty. Moreover, Vitamin D is also crucial toward preventing the onset of rickets, osteoporosis and other conditions brought about by a deficiency of the nutrient. Let’s look at how you can encourage a deeper awareness of Vitamin D at home. Of course, the first thing you will have to do is to change your eating habits by promoting foods rich in Vitamin D. For one, egg yolks are known to contain a large volume of the nutrient, so you might as well serve your kids a healthy omelet. Scramble the eggs thoroughly until they become fluffy. You can add some spinach if you like to make a sumptuous and nutritious meal no one will want to miss out on. Aside from eggs, there are other great sources of Vitamin D, including fatty fish such as salmon and tuna. You can opt to grill this delicious seafood for lunch, which your kids will truly love. Aside from that, a good serving of mac and cheese can also make for a great snack, considering the fact that dairy products are also rich in Vitamin D.
Sure enough, the best source of Vitamin D is actually that big flaming ball up in the sky. 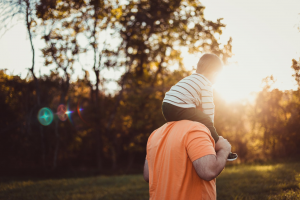 Sunlight is one of many natural sources of the nutrient, so you may as well bring your kids outside and expose them to faint rays of sunlight for 10 minutes at most, preferably between 6 am to 7 am. Prolonged exposure, however, can lead to the development of diseases such as skin cancer, so make sure your kids get the right amount of sunlight at a time. Did your kids miss their early morning serving of sunshine? You can bring them to the park around 4 pm where they can receive an ample amount of Vitamin D. To be safe, you will have to use the right sunblock that will protect your kids from overexposure, just in case they have sensitive skin. Adults have numerous sources of Vitamin D supplements. For one, Thorne Research is well known for its line of hypoallergenic products that are not mixed with additives. When it comes to choosing the right Vitamin D supplements for your kids, however, ample research is important before making a decision. To be sure, consult your pediatrician so you can get a good list of Vitamin D supplements that are both safe and effective. There’s also a growing body of evidence that we need a lot more for healthy functioning than the baseline. It’s a lot more than “preventing rickets” – it’s about a strong immune system and a host of other body functions. Consider this: The need for vitamin D was so strong that evolution stripped down skin melanin almost as soon as humans migrated into northern climates!